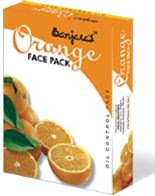 Apart from these homemade multani mitti face pack, lemon face pack or sandalwood face pack, I also use store-bought face packs like this Orange face pack from Banjara Herbals in summers. Orange peel powder is an amazing ingredient that works wonders when used in face packs for oily and greasy skins, and this orange face pack not only has orange peel powder and many other herbs, but also contains kaolin powder which helps draw excess sebum from the pores. After a single application your skin feels tight, rejuvenated and refreshed and I’ve found that if used for several weeks, it lightens blemishes considerably. If you have the time you may also prepare your own face pack with these ingredients: 1 tsp Orange peel powder, 1 tsp Multani Mitti (Fuller’s Earth) / kaolin powder clay, 1 tsp honey and 1 tsp Rose water too. It’s a highly effective face mask for oily, acne-prone skin with blemishes and in summer months. I have never ever heard that orange peel is good for the skin. I have an orange tree out back. I am going to whip some of this up tonight. The best part of the brand is that their products seem natural.